Ash Wednesday is March 1, 2017, so today we’re highlighting some of the many Ignatian-inspired features designed to help you observe Lent. Foster a daily practice of spiritual calm where God is at the center. Living Lent Daily is an e-mail series delivering fresh reflections based on the Scriptures of Lent. Each day’s message includes a quotation from the day’s Scripture readings and a brief reflection to spur prayer and self-examination. The messages also include suggestions for further exploration of Lenten themes through additional online articles and prayers. Sign up now. Enjoy a visual prayer experience this Lent. Each week includes a video commentary about a work of art inspired by the Sunday Scriptures and an accompanying Ignatian reflection. 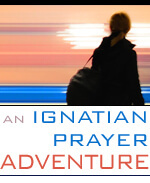 Join in an adapted version of the Spiritual Exercises, perfectly timed as a Lent and Easter retreat. This year author and dotMagis blogger Becky Eldredge will share her experiences with the retreat through posts on Wednesdays. The retreat begins on the Sunday before Ash Wednesday (February 26) and concludes the week after Easter. Reflect with this series based on the words of William A. Barry, SJ, as they appear in the book Lenten Meditations: Growing in Friendship with God. Take up the practice of reflecting on your day, its gifts and graces, and the progress you are making in life with Christ. From Ashes to Glory is a way of praying the Examen through Lent, by Joseph Tetlow, SJ. Pause to review your day in the presence of God with this six-session series led by Jim Manney. Visit Creighton University’s Online Ministries for many excellent seasonal resources. Listen to Tim Muldoon’s audio reflections, which accompany suggestions for prayer and action, leading from Ash Wednesday to Easter. Pope Francis considers the Parable of the Rich Man and Lazarus in his annual Lenten message. If you’re looking for some off-line inspiration, select a book to accompany you through the season. For even more Lenten ideas, see our page of Lent resources.